"Mom, whatever you do, don't go outside. I need a little privacy for my work." Of course I ran to the window immediately, and this is what I saw. 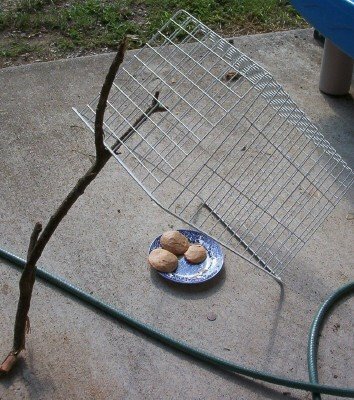 The cookies we just baked set out to attract a squirrel. When I asked Andrew why he didn't finish his share, he said, "I'm not hungry anymore." It's so simple to him. I wish it were simple to me. 1. Leaving the house without a bottle of water and a healthy snack...necessitating unnecessary money and calories on the road. 2. Not thinking through dinner plans until four pm, which means we eat something frozen instead of something fresh. 3. Going on the day's errands without the gym bag in the car. If I have to go home for the bag, I end up staying home. 4. Beginning the day by thinking about what I will eat instead of what I will pray. This story, the "lego traction" story and the "10 chicken-nugget" story. . . your kid cracks me up! This boy will keep you on your toes. So bright. He's priceless. I'm cheering for you as you find your way out of these traps. My big one is eating my son's food--both his leftovers, and serving myself the high-fat, high-calorie foodstuffs that an underweight toddler needs and a chunky mama doesn't! It started out when he was very uninterested in food (due to allergies and reflux as it turns out) but would take some interest if it came from my plate...a year later it is a hard habit to break. How old is he now? He is so inquisitive and inventive!!! Wow! I know he is young but can't remember the age now. He is so bright...and cute too!!!!! Thanks for keeping us up on more of his antics.... he is amazing!! You can do it. Don't get discouraged. You are so right. When I don't plan ahead, I eat all manner of naughty stuff just because it's there and easy to get to. I love your last sentence. It really is the crux of the whole matter. "Only" two pounds?! Two pounds is good! Now, if you had gained two pounds, that would be different. Your lack-of-planning areas are the same as mine, ugh. Praying for you, dear Meredith. I don't know about all that other stuff--but 2 pounds in ten days sounds just about right! You know you aren't supposed to lose too much weight too fast. Just hang in there...you'll do fine! Oh, and I know it's hard to do with little ones, but have you ever considered a weekly menu plan instead of doing it every day? You shop for everything you need in one trip. When you wake up on Tuesday and say, "ah-ha, we're having spaghetti tonight!" you'll feel much better and that will be one burden off your shoulders. Keep your menus simple. In fact, you might try assigning a main course to each day--ground beef Monday (like tacos or spaghetti), chicken Tuesday, pasta Wednesday--see where I'm going? And did the little guy catch his squirrel? I have a 'pet' squirrel who will come when I call her...but only because I feed her peanuts, LOL!